This half term I was determined to get on a few days out so clutching our shiny, new National Trust membership cards we headed out to one of our nearest properties, Rufford Old Hall. I’ve lived close to it for years but never actually been to visit which was the whole point of us getting National Trust membership. We have a fair few properties close to us and this will make sure we get out and see what’s in our area. As much as me and my husband would have loved to go around the house that just isn’t going to be possible with three small children. They have obviously realised this so have set up lots of outdoor activities for you to do with your family. As it is the school holiday most of the properties are holding events for 50 Things To Do Before You’re 11 3/4 and they were making mud pies in the courtyard! They also provide free bug hunting and wild art kits for you to loan as you explore the outdoors. 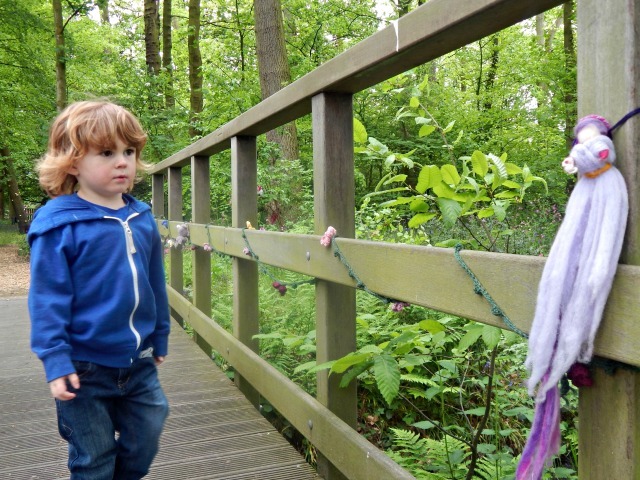 Lucas was thrilled to see a basket full of binoculars to borrow and we grabbed a bird spotting checklist too; I just love these little extras which mean you can make more of the outdoor experience without having to bring everything along with you. 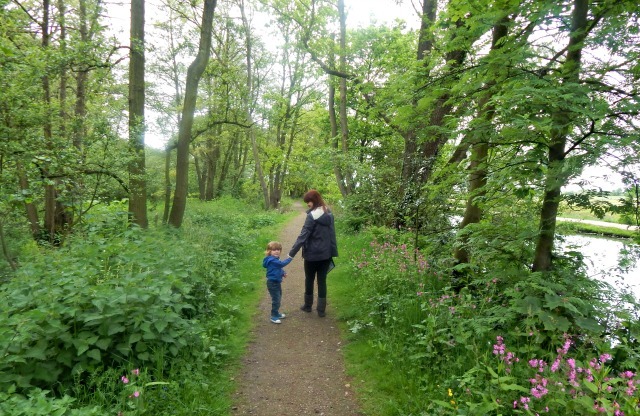 We set off into the woodland first, walking along the canal, spotting bluebells and listening to the birds. It was quiet so we took our time, also Lucas was still being a bit grumpy after a short nap in the car so he needed a little while to adjust. 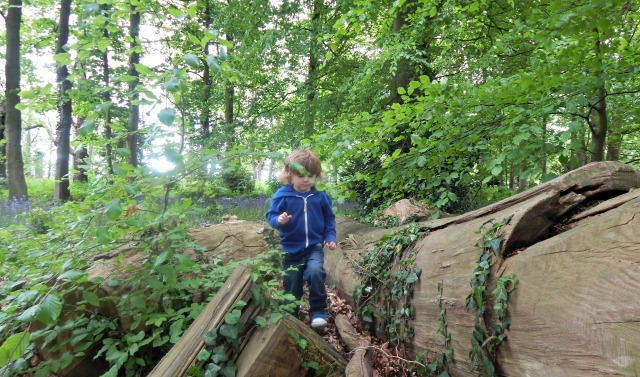 The woods aren’t too big so perfect for little legs but there is still lots to see on the circular route. 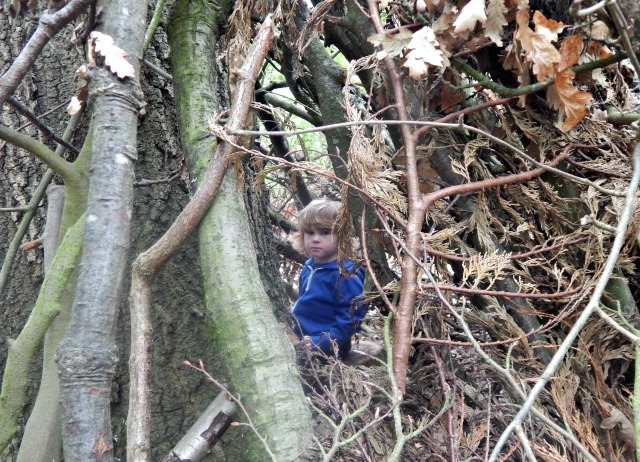 We headed over wooden bridges and looked out for the trolls underneath and checked out the dens that had been built in the woods. 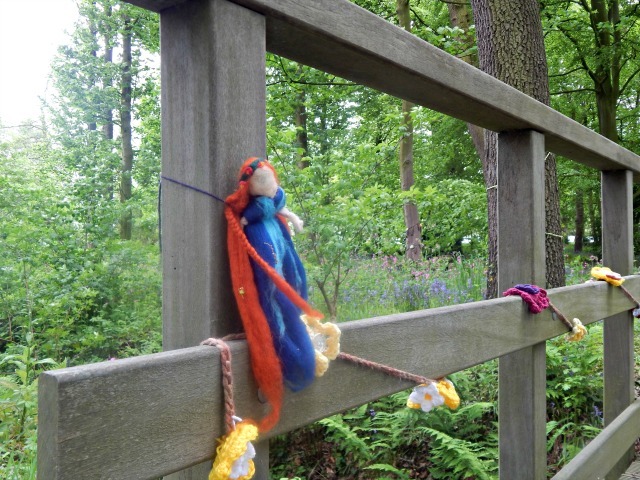 Part of the woods have been transformed into the Woollen Woods, an outdoor art installation supporting The Campaign For Wool, which made the walk extra special. 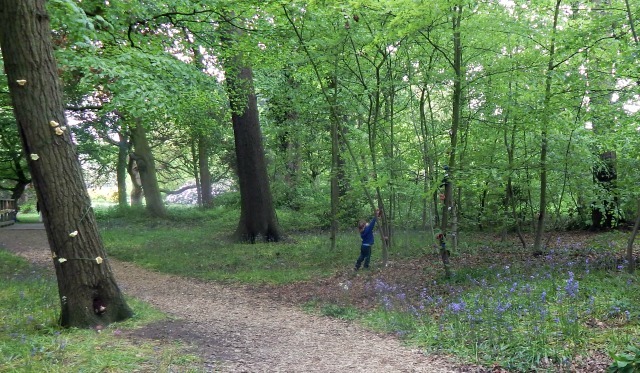 At this time of year all the bluebells are sprouting up and the forest seems super green so to see little woollen fairies, flowers and creatures hidden in the undergrowth is really quite enchanting. Lucas ran eagerly from tree to tree to see what animals were hiding and we kept finding new critters every few steps. 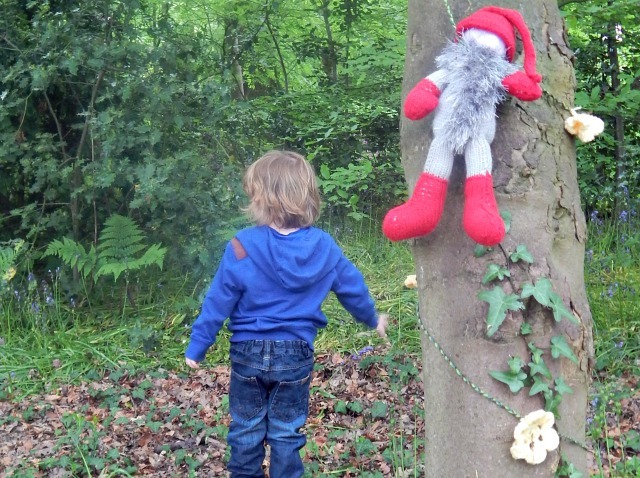 Our bird spotting went a little astray as we were caught up in spotting the woollen creations but it was so much fun and a really different walk through the woodland. It is on until the end of August 2015 and I would really recommend going while it is on, especially with young children. 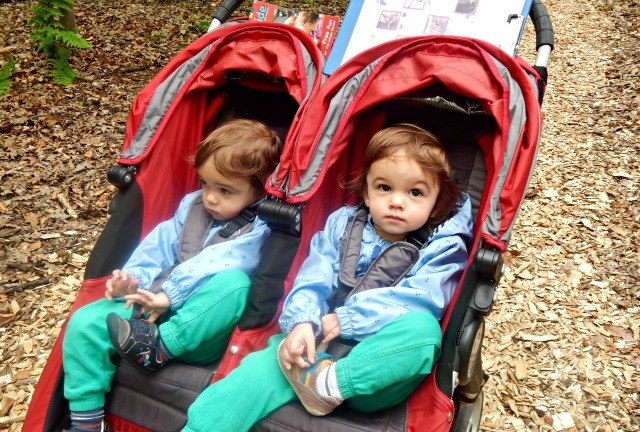 Once we had explored the woods we bravely returned the pushchair to the car and let the twins loose to have a wander round the gardens…there are no pictures from this part of our day because it was total chaos! We have reins but still end up chasing them round everywhere, trying to coax them in the right direction and after a mad 15 minutes in the garden we decided cake and tea was needed. 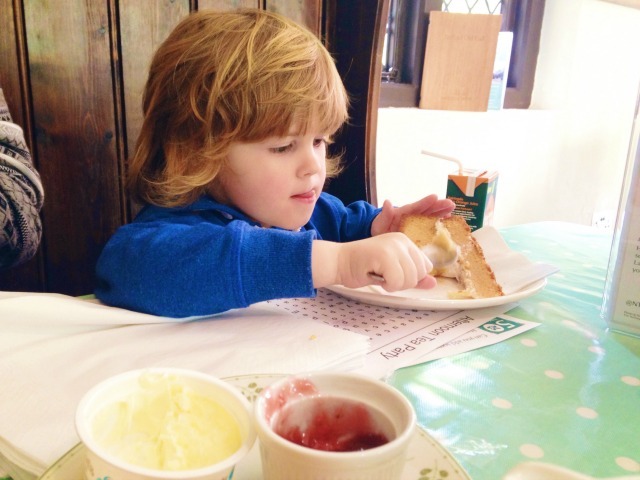 The lady in the tea rooms was so helpful finding us high chairs and lovely with the children even though she was obviously busy. The cake was homemade and delicious, well worth a little pit stop if you are visiting. I’ll be honest I can’t really remember any proper days out last year, we were so caught up with the twins that getting out was the last thing on our mind. It is nice to feel like we can go on adventures again. The twins chatter away like crazy when they are out somewhere like this and it must be so different to them as I guess they have been quite sheltered until now. Lucas is usually happy when we find cake or ice cream and it feels like a total breath of fresh air to get out somewhere new with them. I love to watch them seeing new things, taking in the world around them and enjoying each other’s company. When we get this family time together I feel a little refreshed too; so much of my day is spent talking to three children and most of it is indoors. Although I don’t always notice I think it does start to wear you down. That is why these moments are extra special and we aren’t doing anything wildly exciting but we are together, away from the house, from the television, from all distractions. We are explorers and adventurers, we get to see the world through our children’s eyes and it is a real privilege. Funnily enough, that’s what we’ve been up to today, only at a National Trust property down near us! We’ve made dens, Kitty got a nice clear note on a grass trumpet and we tried pooh sticks only to have a wind vs flow of river standoff. It’s so lovely to get out and about in the fresh air and sunshine isn’t it! 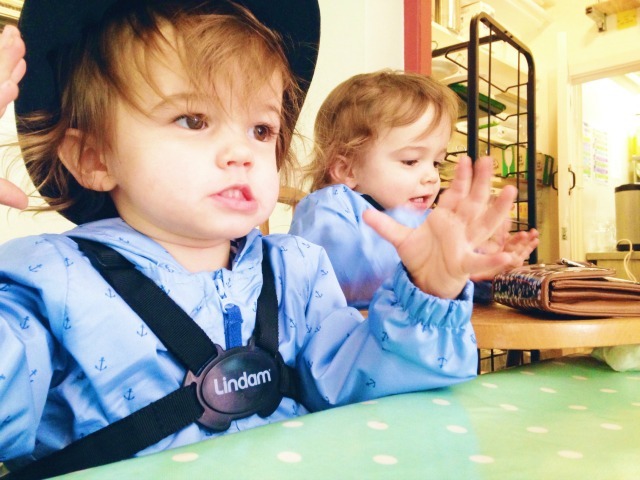 It’s fantastic that you had such a great day: i recall those out of the pushchair moments so vividly! Fantastic write up, we defintely need to go before end of August. 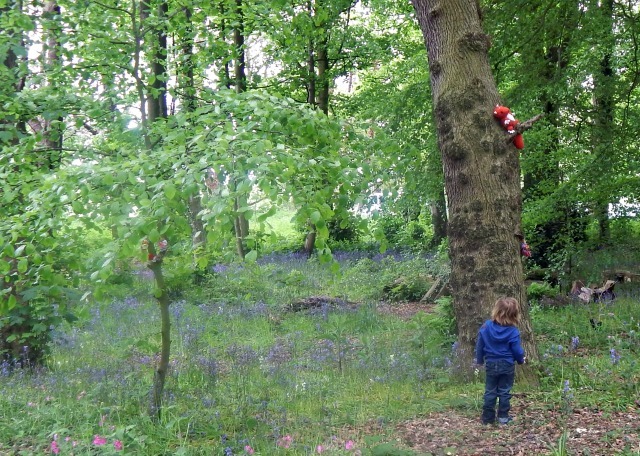 The national trust really is great, I take so much inspiration for things to do at Coombe Mill from seeing posts coming in on Country Kids from the National Trust gardens, together with the visits we make. The box of binoculars looks spot on, I’d love to do this but they are so expensive, I wonder where the NT buy theirs from? 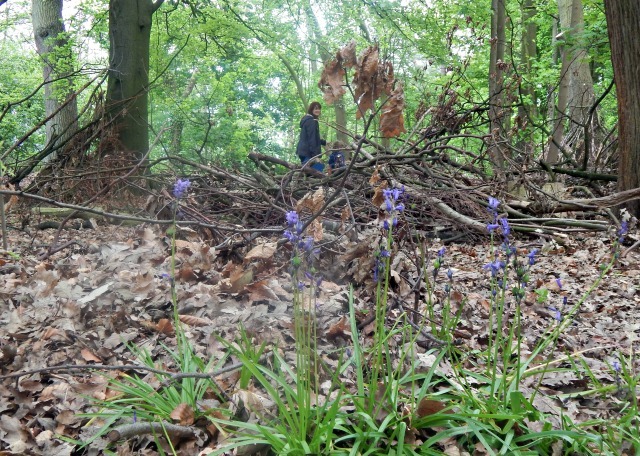 I love the photos you have in the bluebells and the woolen fairies, such a pretty time of year for your visit. Thank you for sharing with me on Country Kids. Wonderful scenery, photos and activities for your children too. I adore the National Trust and grew up in the UK visiting many gardens and houses that I am forever thinking back on. I actually used to have a dream of working for the NT – that was before destiny took me to New Zealand. My parents are members and spend many happy days of their retirement visiting places around the UK. This looks like a lovely place – definitely somewhere my family would love to visit. 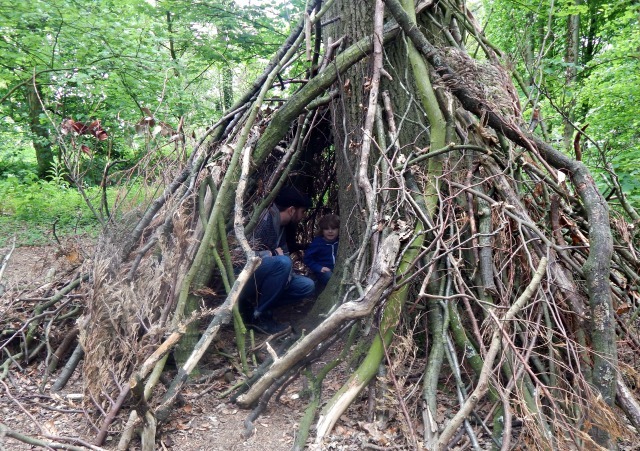 Can’t beat beautiful woods, dens and cake! Thank you for joining in with #SummerDays this week – I really hope you will join in again next week.